A body of 150 rabbis and public figures voted today to elect the two new Chief Rabbis of Israel. Zionist candidates failed. Rabbi Yitzhak Yosef has been elected Chief Sephardic Rabbi, and Rabbi David Lau has been elected Chief Ashkenazi Rabbi. The rabbis are to serve 10-year terms. Rabbi Lau, born in 1966, studied at Yeshivat Hayishuv Hehadash and Yeshivat Bet Matityahu. He was the first rabbi of the community of Shoham. When the city of Modiin was established, he became its chief Ashkenazi rabbi. He is a major in the Intelligence Corps reserves. Rabbi Yitzhak Yosef, born in 1952, heads the Hazon Ovadia yeshiva and wrote a series of books on halakha, the Yalkut Yosef. The results are a victory for the hareidi-religious stream. The two victorious candidates had reached a deal, according to which the supporters of each would vote for the other. Candidates from the religious Zionist stream failed in both the Ashkenazi and Sephardic races. Rabbi Yitzhak Yosef is the son of Rabbi Ovadia Yosef, former Chief Rabbi. Rabbi David Lau is the son of Rabbi Yisrael Meir Lau, also formerly Chief Rabbi. Prime Minister Binyamin Netanyahu called Rabbi David Lau after the victory. "In the spirit of the unity of Israel," Netanyahu said, "I congratulate you." Netanyahu mentioned that the elder Rabbi Lau conducted his marriage ceremony, and the rabbi replied that he hopes that his son will get to conduct the marriage ceremonies of Netanyahu's sons, once they find fitting wives. A body of 150 rabbis and public figures voted Wednesday to elect the two new Chief Rabbis of Israel: one Chief Sephardic Rabbi and one Chief Ashkenazi Rabbi. Voice of Israel public radio said Wednesday evening that 147 of the 150 members had voted. Six candidates were in the race for the two positions. Rabbi Yaakov Shapira, Rabbi David Stav and Rabbi David Lau were contending for the position of Chief Ashkenazi Rabbi, while Rabbi Shmuel Eliyahu, Rabbi Yitzhak Yosef and Rabbi Tzion Boaron were competing for the post of Chief Sephardic Rabbi, also known as the Rishon Letzion (literally: The first for Zion). Two other candidates had withdrawn from the race. 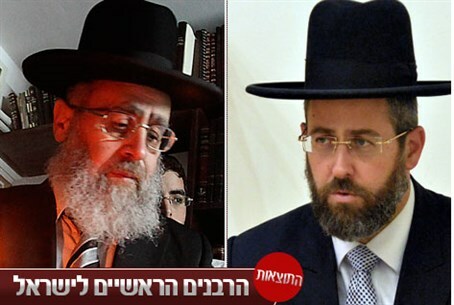 Rabbi Eliyahu Aberjil submitted his decision to withdraw from the race earlier this week, and Rabbi Ratzon Arusi announce he was dropping out Tuesday. Both were candidates for the Sephardic post. Rabbis Shapira, Stav and Eliyahu are identified with the religious-Zionist stream of Jewish thought, while Rabbis Lau, Yosef and Boaron are affiliated with the hareidi-religious approach. There have been numerous calls in recent months to unite the two positions, and elect just one Chief Rabbi. The idea was first floated by MK Moshe Feiglin, and then adopted by Ministers Naftali Bennett and Tzipi Livni.